This poem is my way of expressing concern for a better understanding of homelessness in our society. I am inspired by others who have dedicated much more of their time to directly reach out with acts of generosity, moments of kindness, friendship and most of all…conversation. It is this respect that sets an example for others. If the majority of us do no not speak to those on the street, then thank God there are people like Dennis Cardiff , Kaze Gadway who do…..on a regular basis. Kaze Gadway blogs at “KazeStories” sharing her experiences as she spends time with the homeless, offering them water and blankets and talking with them. I admire her willingness to become involved by not only acknowledging them, but by listening to their stories, offering hope, comfort and helpful ideas if only to get through the day. Her compassion is put into action on the streets of Albuquerque, New Mexico. Please take the time to check out both of their blogs. 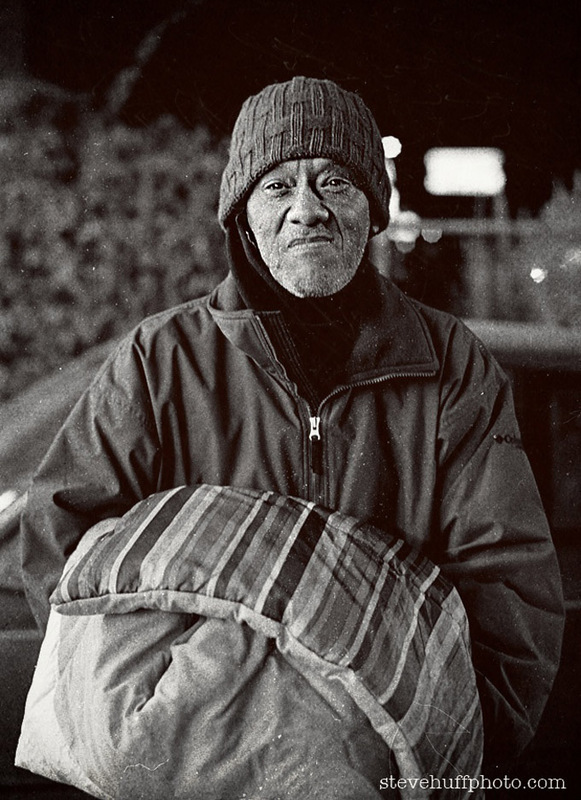 Photograph: Courtesy of Steve Huff from a collection called “My Homeless Project”. His candid shots portray the hardships of life on the streets of Phoenix, AZ . Steve took the time to speak to homeless men and women during his daily walks to learn of the real life events and situations that lead to homelessness. In exchange they allowed him to take their photographs. Posted in Humanity, Inspiration, Life, Mental Health, Photography, Poetry, Society, Survival and tagged Dennis Cardiff, Gotta Find a Home, helping the homeless, homeless, Kaze Gadway, KazeStories, Steve Huff. Bookmark the permalink. Working in the non-profit world for the past 17 years, I have witnessed first hand, the dismissive attitude around our homeless population. These people are our mothers, our fathers, our children & our friends who, for whatever reason, have found themselves on the street. Many times a safer environment from where they have been. Getting to know their story makes them human, something many people fear for it easier to walk away when you know nothing about the person before you. Thank YOU for taking the time to read it! Sharing it is what this post is all about. There are too many assumptions and stereotypes about homelessness. We have no right to judge others..especially when we do not know their situations. Also, many people are not aware of the lack of services available. This poem brought tears to my eyes. Absolutely beautiful. May we have permission to reblog this poem with a link to your blog? I would really like to share this with others. This is a moving poem and serves as a reminder of one of the “wicked” problems of our society. Yes, I follow Dennis and his blog is instructive and transformative. Wow! Very interesting. It would definitely be an eye opener to put ourselves in their shoes..even for a day. This poem and the accompanying photograph gave me chills. We have been granted permission to reblog this. Please visit this website and show your support for this blog. Excellent poem and photo!!!!!! I too follow Dennis, he has done such a wonderful job! Glad you mentioned him and his work!! First of all..thank you! I can take credit for the poem only and was very happy that this fine photographer gave me permission to use the photo. Excellent! So honest and heart breaking. I love your picture and composition. This is my second time reading this wonderful work and I love this piece even more the second time around! A great and layered write, true and emotional! Fabulous job!